We’ve all opened the door to the doctor’s office and had our hearts sink at the sea of patients waiting to be seen, wondering just how long we’ll have to wait, and how much quality time we’ll actually get with the doctor once we are seen. With as many as 87% of seniors diagnosed with at least one chronic health condition, senior doctor visits are a frequent occurrence. And with doctors so busy throughout the year, particularly so during cold and flu season, it’s important to take a little time prior to appointments to plan how to best maximize time during healthcare visits. Anything that has changed since the senior’s last appointment, to include any physical, emotional, sleep, appetite, or other changes. Specific questions you want to be sure to ask the doctor. A current list of all prescriptions, over-the-counter medications, vitamins, and supplements that your senior loved one is taking. It’s helpful to keep an ongoing health diary for your senior loved one, so information is tracked and kept in one convenient location. You can then bring the log with you to each senior doctor appointment. 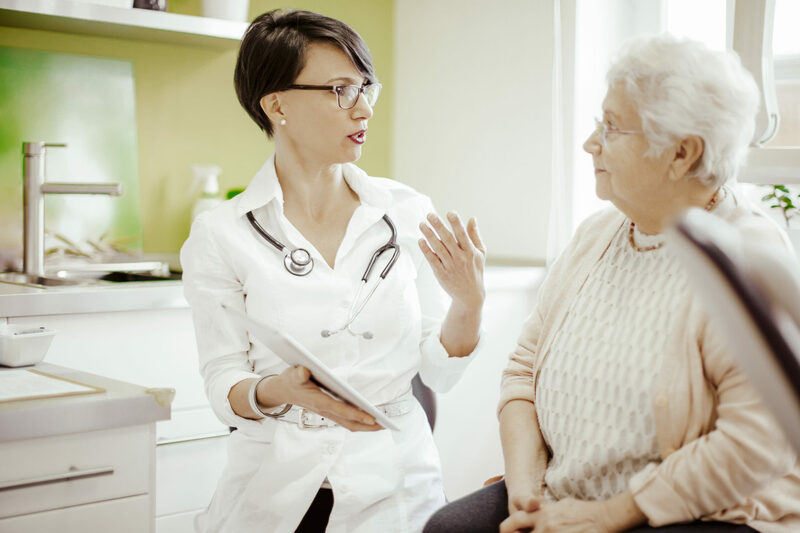 Once your senior loved one is ready to be seen by the doctor, share with him or her any immediate concerns, as well as the information you’ve gathered together as outlined above. Take notes on the doctor’s recommendations and suggestions, or ask for a printout of this information, to make sure nothing falls through the cracks afterwards. What is the ideal cholesterol level for the senior? Are there certain foods he or she should eat? Are there any foods he or she needs to avoid or limit? What information is important to know about prescribed medications? Side effects? Any potential interactions with other medicines or supplements? How often should blood pressure checks be taken? Should the senior lose (or gain) any weight? What’s a good exercise regimen for the senior? For additional senior doctor visit tips, contact the California senior care professionals at Hired Hands Homecare. We can provide you with free helpful resources, and a variety of customized home care services to improve senior health, such as transportation and accompaniment to medical appointments and procedures, picking up prescriptions, providing medication reminders, preparing nutritious meals, and much more. Contact us at (866) 940-4343 to learn more about our senior home care solutions in Marin, Sonoma, Napa counties and the Tri-Valley.